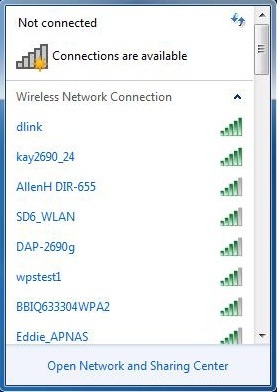 How to connect a Wireless Network Using Windows 7 on D-Link DI-604 Router? 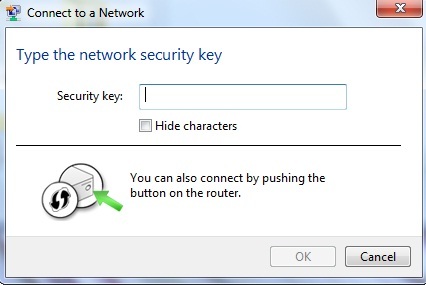 Connect a Wireless Network Using Windows 7 on D-Link DI-604 Router. It is recommended to enable wireless security (WPA/WPA2) on your wireless router or access point before configuring your wireless adapter. If you are joining an existing network, you will need to know the security key or passphrase being used. 1. Click on the wireless icon in your system tray (lower-right corner). 2. The utility will display any available wireless networks in your area. 3. Highlight the wireless network (SSID) you would like to connect to and click the Connect button. If you get a good signal but cannot access the Internet, check your TCP/IP settings for your wireless adapter. Refer to the Networking Basics section in this manual for more information. 4. The following window appears while your computer tries to connect to the router. must be exactly the same as on the wireless router. How to connect to an available wireless network in range using Windows 7? Why do I get a message saying “can´t find certificate” whenever I try to connect to a wireless network on a DIR-655 router? How to D-link DNS-323 map a Volume using the Windows 7 or vista Map Network Drive Utility?